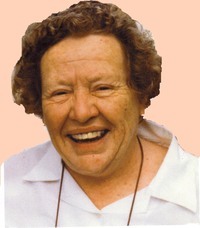 The bulk of the information on this particular Blog comes from the notes made by Radha (Betty) Hoare, pictured, who was known to us as Mother Radha. Why the 'name change'? Well, Holy Men often give devotees or followers 'role-model' names that are intended to inspire them. 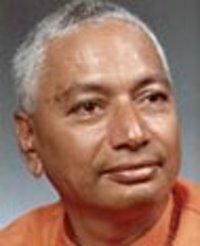 In Radha's case, she had the great privilege of being very close to both Swami Venkatesananda (below, right) of the Divine Life Society on Mauritius and also of course to Swami Shivapadananda, the nucleus of this Blog. She spent many years living in the Sri Sarada Devi Ashram (pic of shrine in the convent on the left) of the Ramakrishna Centre of Southern Africa, in Asherville, Durban, South Africa. 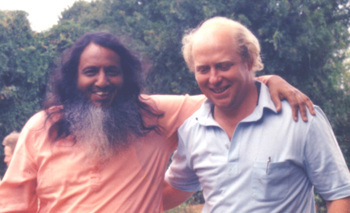 Radha's one son - Tim (see picture of him with Swamiji in 1984 - below) - is the man who looked at the notes Radha had made and declared them indecipherable to anyone but her. They were her own form of short-hand or speed-writing. I know from personal experience what those notes looked like. Very ordered, but inaccessible to anyone other than her, God or a professional cryptographer! ;-) Tim told her he couldn't read them, and in high dudgeon (she was a personality and character of note!) she set to (in her 70s, but undaunted) to reproduce the notes in MS Word on a computer. Tim took those notes following Radha's passing on a few years back and they're the basis of the Daily Readings that you now get on this Blog. 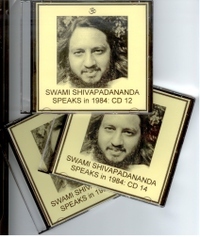 Radha also made hundreds of hours of audio recordings of Swamiji speaking to devotees. Tim took those tapes, cleaned them up (i.e. edited out background noise) to the best extent possible and they are now available on a series of 30 CDs. You can order them either through Tim in Cape Town, or, if the Gauteng demand surfaces, through me (Clive Simpkins, a.k.a. Br. Francis) in Johannesburg. If the demand is sufficient, the CDs will be reproduced in greater quantities and maybe even get some fancy labels and the like. Right now, the actual discs inside the cases are simply numbered. What's on them is priceless, rare and beautiful. If you're interested, drop Tim an e-mail to timhoare@webmail.co.za Price? A mere R20 per disc. I was listening to CD number 12, randomly selected, on a long drive a few days ago. The intensity and relevance of what Swamiji was saying, struck me as forcibly as if I'd been sitting with him again. The Blog notes are relatively random, whereas the continuity of subject matter on the CDs is very powerful. If you want to 'spend time in the company of the Holy', then listening to the CDs is a good way to do it!